Welcome to the latest installment of “What I Eat When I Don’t Have to Cook for a Man”. No meat, lots of veggies and even more cheese. I love, love, love changing up my salad game and I had to show you this one because it was kind of a throw-together but totally knocked my socks off. What I love most about it is that I made it on a Tuesday and had the rest in the fridge for easy lunches and dinners for the rest of the work week. This just gets better and better on day 2 and beyond. I’m sure you don’t even have to roast the peppers and onions but I love the extra flavor it gives. Another suggestion: throw a few pita chips on the side. The perfect lunch! Preheat oven to 400 degrees. Place the diced red pepper and red onion on a baking sheet and drizzle lightly with the olive oil. Roast for about 30 minutes, tossing once or twice throughout cooking. Veggies are done once they are caramelized and starting to blacken in spots. While the veggies roast, stir together the dressing ingredients in a medium bowl. 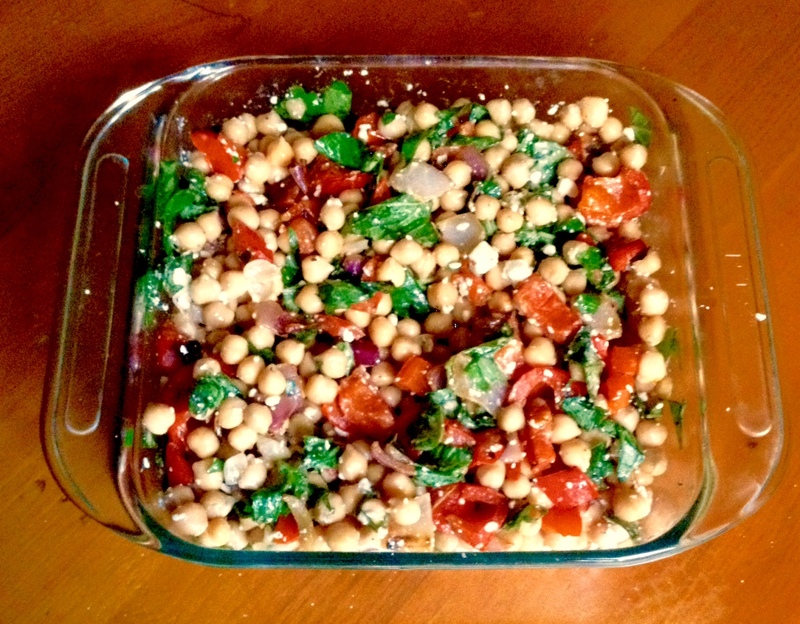 Chop your basil leaves and add to the bowl, along with the chickpeas and feta. Toss. When the veggies are cooked, add them to the other ingredients in the bowl and toss again. Season with extra salt and pepper to taste, if desired. You can serve the salad right away but I prefer to chill it for at least a couple of hours before serving. The flavors meld together and taste even better as it sits. Sounds delicious ! I will definitely try this one .